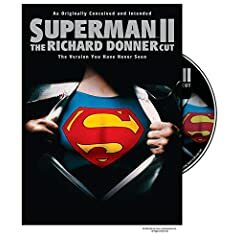 Richard Donner was canned during the shoot of Superman II, and Warner Bros handed the reigns over to Richard Lester. I'm usually annoyed when studios release another version of a movie on DVD much later after releasing the original. It's usually a ploy to extract more dollars from real fans (e.g., King Kong--Three-Disc Deluxe Extended Edition), but this is different. I didn't think this cut would ever see the light of day, and if nothing, it will be interesting to watch purely as a lesson in the power of editing.